LAKE SUCCESS, N.Y., July 26, 2006 � Both of Canon’s new three-CCD HD camcorders � the XH A1 and XH G1 models - provide broadcasters, cinematographers and production facilities with a full line of professional, high quality, low cost HD solutions. Broadcasters, Event videographers, and cinematographers with tight budgets will appreciate Canon’s flexible, powerful and feature rich XH A1 and XH G1 HD camcorders. Whether on set, in the field, or shooting a feature film, these two camcorders offer selectable frame rates and deliver stunning 1080i HD video. Building on the image quality of the award winning XL H1 model, the XH A1 and XH G1 HD camcorders offer a Genuine Canon 20x HD zoom lens, Super Range Optical Image Stabilization, 60i, 24F, 30F frame rates and total image control. The XH A1 model will be available in late October for an estimated selling price of $3,999, while the XH G1 model adds HD-SDI output with embedded audio and timecode; Genlock synchronization and Timecode In/Out and will be available in mid-November for an estimated selling price of $6,999. "Canon is now offering a full range of HD solutions that give professionals the control they need at a price point they can afford." said Yukiaki Hashimoto, senior vice president and general manager of the consumer imaging group at Canon U.S.A., Inc., "Joining the open architecture of the XL H1 model, Canon’s newest camcorders round out our high definition line by providing features and design demanded by a wide variety of professionals." Both camcorders have three 1/3 inch native 16:9 1440 x 1080 CCDs that capture images at 1080i resolution. 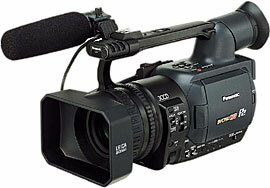 The camcorders feature 60i, 30F and 2F selectable frame rates to allow users to adapt to each assignment. At the 30 Frame rate, camera operators can capture high-speed subjects with spectacular clarity. Filmmakers can utilize the 24 Frame rate to create the look and motion of movie film. The 60i frame rate works well in applications such as ENG or Reality TV. For a fee, users can also send their cameras in to Canon’s Factory Service Center for an optional 50i/60i upgrade to conform to PAL standards. Calling on more than 70 years of optical excellence in manufacturing lenses for broadcast and still photography, the camcorders feature a Genuine Canon 20x HD Video Lens. This lens includes both fluorite and UD (Ultra-Low Dispersion) glass elements to achieve HD performance throughout the whole zoom range. These elements minimize color fringing even at high magnifications. Multi-Coating reduces flare and ghosting. The "L" series lens has a focal range of 32.5mm - 650mm (35mm equivalent), delivering exceptional versatility for a wide variety of shooting situations, especially documentary and newsgathering applications that demand a wide field of view. In addition to manual focus and zoom rings, the lens includes a manual iris ring for the smooth, fine adjustment that professionals prefer. For added control, a High Speed Zoom Mode allows the zoom to respond more quickly and intuitively. Furthermore, the lens contains two built-in Neutral Density Filters (1/6 and 1/32). The Canon XH A1 and XH G1 HD camcorders feature Canon’s Super-Range Optical Image Stabilization to help deliver smooth, steady video even at longer focal lengths. The system uses two detection methods (gyro and vector) to sense the widest range of vibrations from hand-held shake, to vibration from a moving vehicle. By using optical stabilization, it can compensate for a greater degree of camera shake and avoid any loss in image quality, unlike electronic image stabilizers. Since it is critical to achieve very sharp focus when shooting in High Definition, the XH A1 and XH G1 models feature Canon’s revolutionary new Instant AF focusing system. It offers a dramatic improvement in auto focus speed and accuracy (compared to traditional autofocus systems). The Instant AF feature uses an external sensor, in combination with Canon’s autofocus system, to significantly decrease the time it takes to find focus, even in low light conditions. This new system achieves focus instantaneously, reducing focus "hunting." Users can especially see the benefits of Instant AF in high brightness, and night shooting situations. Camera operators can capture fast, accurate focusing, even when following a moving subject. The XH A1 and XH G1 camcorders feature Canon’s DIGIC DV II proprietary digital signal processor, which Canon designed specifically for HD acquisition. Found also in Canon’s flagship XL H1 HD camcorder, the DIGIC DV II processor provides highly accurate color and tonal reproduction needed for high HD image quality. A new noise reduction system, combined with a new gamma system, helps to reduce noise in monotone and shadow areas. The fast processing speed of the DIGIC DV II chip allows video and photos to be shot simultaneously. Furthermore, the processor’s low power consumption, contributes to longer battery life. The XH A1 and XH G1 HD camcorders are designed to handle a variety of different shooting situations. Canon housed the 2.8 inch Widescreen LCD securely beneath the handle, which allows it to swing out easily when needed. The handle provides an additional record start/stop and a zoom control, making it ideal for low-angle shooting. The new models include toggle switches, which are standard on high-end video equipment for gain, color bars, and white balance. To reduce camcorder size, an internal battery compartment holds one Canon BP-950G or the large capacity BP-970G battery. Both camcorders offer two built-in XLR terminals with mic/line level and phantom power, an external microphone holder for attaching shotgun microphones, a voice-recording mode, and two-channel manual audio level adjustment allows precise control. The image, display items, and functions of the Canon XH A1 and XH G1camcorders can be uniquely customized for different applications and users. Camera Operators can finely adjust a total of 23 image settings, including color gain, RGB independent gain, and 6-axis matrix. These cameras provide a wide range and degree of image adjustment. Users can store a total of nine image presets in the internal memory, or to a Secure Digital (SD) Memory Card for exporting to other XH A1 or XH G1 camcorders. Users can fully customize the camcorder’s display as well, matching the preference of the shooter, or set up for a specific application. The camera operator can hide or display up to 21 different items and they can also personalize (or design for different shooting conditions) up to 20 custom camera functions. Users can save and read up to three groups of settings from an SD Card. Additionally, camera operators can use the sky detail function for removing detail or noise in the sky without affecting other areas of the picture. Users can also increase video gain up to +36dB, for capturing images in extreme low light situations. Like the XL H1 model - the XH G1 HD camcorder includes Canon’s Professional Jackpack Terminals, which are a trio of connections that provide professionals with outstanding quality and versatility: HD-SDI/SD-SDI Output, SMPTE Timecode Input/Output, and Genlock Input. The HD-SDI connection outputs an uncompressed 1.485 Gbps digital signal with embedded audio and LTC Timecode, reducing the number of cables and improving the camera operator’s mobility, or integrating seamlessly into broadcast studios. Professionals can also use the HD-SDI output for playback or easy capture and transfer. The signal can also be set to SD-SDI, during shooting or playback. Users can easily facilitate multi-camera shoots with the XH G1 model due to the camcorder’s Genlock synchronization input. This feature permits trouble free switching of XH G1 camcorders in a multi-camera situation. With its SMPTE time code input/output terminal, each camera on a shoot can lay down synchronous time code. The XH A1 and XH G1 camcorders can both capture 2.0 megapixel photos at 1920 x 1080 resolution to an SD card, which comes in handy in pre and postproduction, storyboarding, and continuity applications. The user can capture photos in video color space while simultaneously recording video to tape. In addition, professionals can use the camcorder as full featured digital still camera, capturing photos in digital camera color space, complete with metering modes, shooting modes, and the option of using a Canon EX Series Speedlite Flash on its dedicated flash shoe. The camcorder includes a still image histogram and EXIF display for exposure verification.